Who’s making wines of character and selling them at reasonable prices? Good old France! 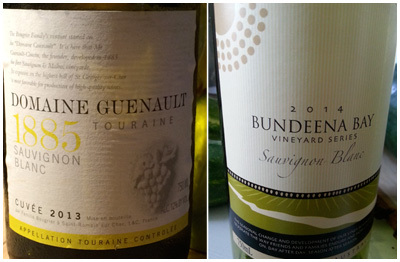 Guenault’s Sauvignon delivers the classic citrussy/green grass freshness of the grape along with a friendly, lighthearted feeling. Tasty to sip anytime, or a perfect start to the evening. Only 12% alcohol. At first I thought the Bundeena was a bit plain, but it has a charming side that is revealed after a few sips. Mild-mannered for Savvy, with delicate tropical fruit flavours, so it’s is more of a party sipper. Enjoy.